You never know what conversations you might overhear at a bar. 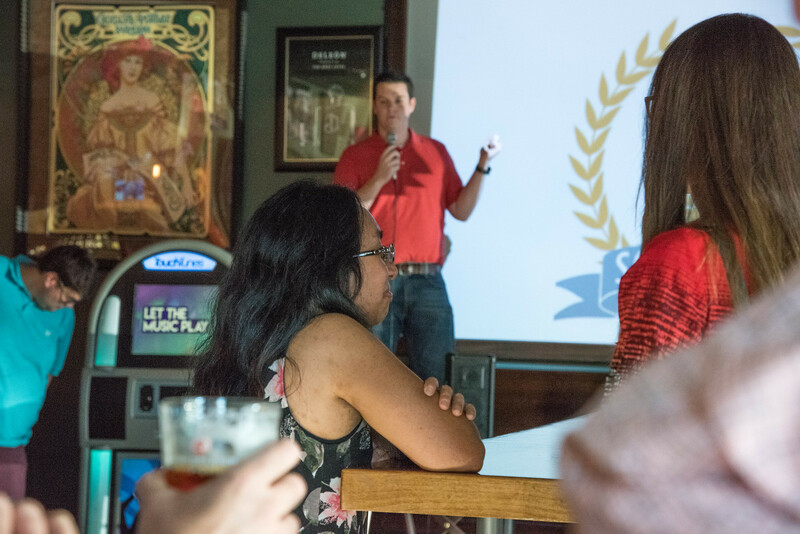 The talk centered on neural proteins and vitamin A-fortified bananas Tuesday night as about 40 science-minded people met at 9th Street Public House for the first Science on Tap CoMo. 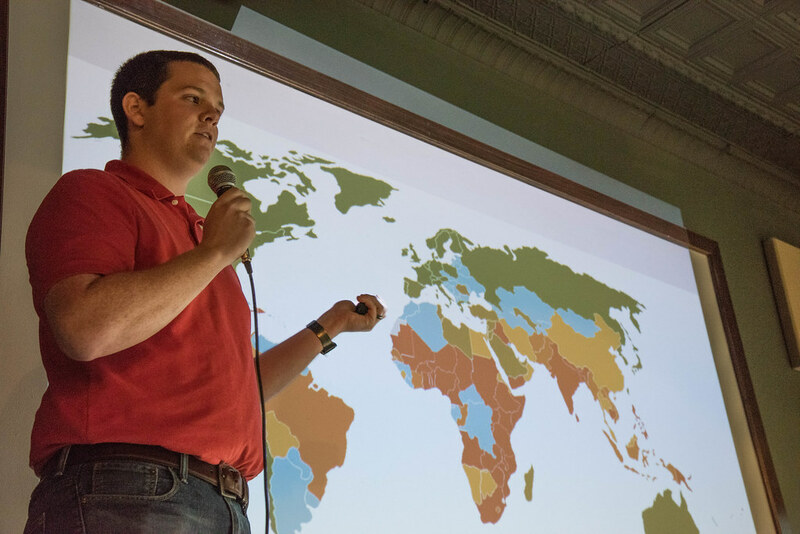 Science on Tap is a monthly program scheduled for the fourth Tuesday of each month, and it gives Mizzou graduate students in science, technology, engineering and mathematics a chance to present research in their field to a casual audience. Anahita Zare and Nat Graham at Public House, both graduate students at the University of Missouri carried the conversation. 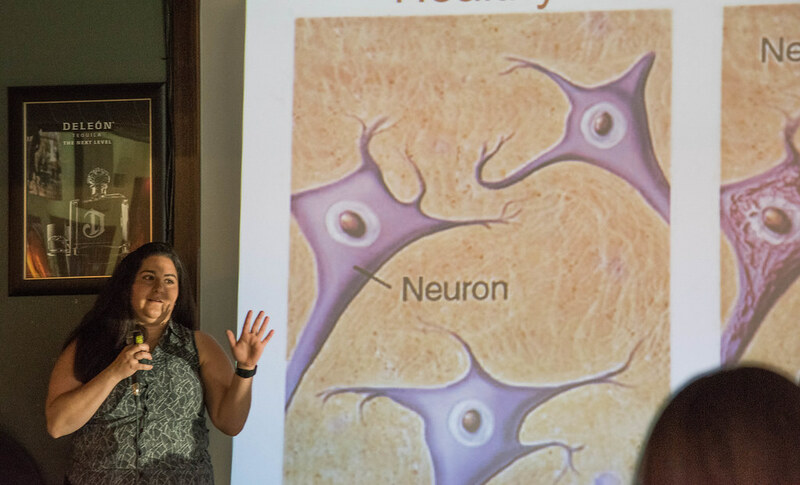 Zare, a Ph.D. candidate in chemistry at MU, spoke about her work on the development of a laser that, once completed, will allow her and other researchers to be better able to study neural proteins in their natural environment. With this ability to better scrutinize drug interactions with these proteins — as opposed to just before and after observations — the work could let researchers make advances in the race for cures to diseases of the brain like Alzheimer’s. The incremental progress of work on the laser is all about the tiniest of details. Zare used an analogy of letters and words – “I’m changing letters and watching what happens to the words …” “I know what I’m changing and how I’m changing it, and then see its manifestations,” Zare said about the task. He specifically spoke of vitamin A-enriched bananas. It could be ideal for countries like Uganda, a very large exporter and consumer of bananas as a staple crop. Selective breeding techniques — including even exposure of test crops to radioactivity to promote genetic mutations that may prove to be useful — are options in the development of vitamin-enriched crops, but Graham said these other techniques are too unpredictable and time-consuming to guarantee the results needed. Graham said he had no fear of GMOs, and in fact really wanted to try a vitamin A-enriched “super banana,” but obtaining one is difficult because of regulations that forbid crossing state lines with these bananas. He also reminded the audience that although the study of plants often seems boring, it goes beyond gardens and forests. Crops are plants, too, and, among many other things, beer comes from crops. So, food security affects your drink. You’ve seen it before in the movies. Sweaty scientists put on their full-body, spacesuit-like get-ups to stave off a potentially extinction-level outbreak and at least one scientist invariably gets infected with the deadly agent of disease. While popular culture propagates this sense of peril, in reality bio-containment labs are designed with safety in mind. “People tend to think bio-containment facilities are dangerous, mostly from movies I think, but the history is actually spectacular,” said George Stewart, a medical bacteriologist, a Bond Life Sciences Center scientist, McKee Professor of Microbial Pathogenesis and Chair of Veterinary Pathobiology. But one type of pressure is an important part of bio-containment lab safety. 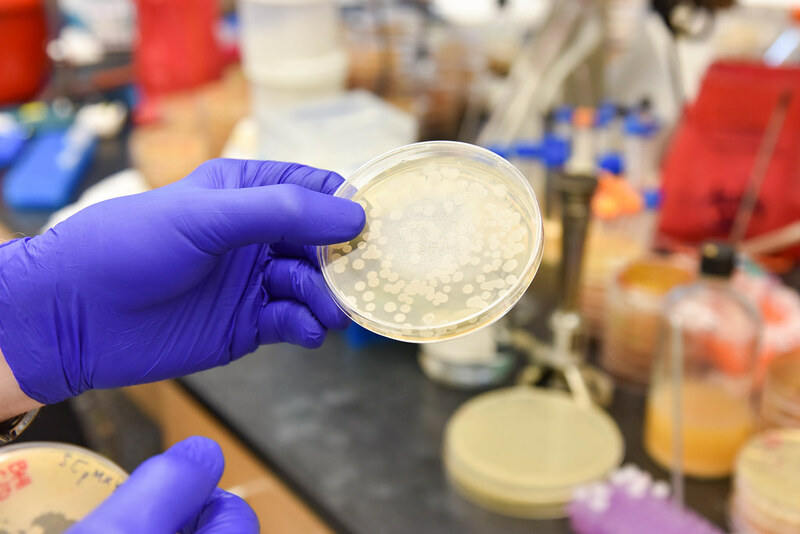 Air pressure differences maintain certain labs at lower pressure compared to the rooms and hallways around them, ensuring that air will only flow in toward a lab and not out, keeping any airborne pathogens trapped inside. “They know if everything is done properly, it’s perfectly safe for them and even safer for everyone else [outside a lab],” Stewart said of the safety features, procedures and systems of bio-containment lab safety in place at facilities like those at the Bond LSC and elsewhere at MU. The powerful capabilities of anthrax and other lethal pathogens call for particular safety precautions for scientists. Stewart looks like he’s straight out of the movie Contagion when donning the full-body suit for his more dangerous research in a Bio-Safety Level (BSL) 3 facility at MU’s Laboratory for Infectious Disease Research (LIDR). In the trees on the eastern fringes of campus, the specialized building is where he and other researchers study diseases animals can transmit to humans, including plague, Brucella, tularemia and Q fever, and mosquito-borne diseases like dengue, chikungunya and now Zika virus. The safety protocols and systems at a BSL-3 lab like the LIDR facility Stewart described reflect the likely transmission by aerosols of the human pathogens inside. After passing through security access to the building and the labs inside, Stewart enters an ante room off of a hallway. The air pressure in this room and the lab beyond it is such that air will only flow in toward the lab, and not out and away. Anything that goes into the lab only leaves if it is autoclaved, disinfected in a steel machine using pressurized steam that “essentially kills everything, even heat-resistant spores,” so that means Stewart changes clothes, removes his watch, phone and any other personal items. Next come layered scrubs and a water-proof Tyvek suit with booties and a hood that cover everything but his hands and face. Two layers of gloves take care of his hands, but shielding his face is a bit more technical. A plastic face cover with a Tyvek hood shrouds over Stewart’s shoulders. Inside, a pump fills the hood with positively-pressured filtered air – this has the inverse effect of the negative pressure of the rooms and keeps air flowing out away from his face and not toward it. Everything inside the lab and the building is about redundancies like that. A final safety measure is that all work on pathogens take place in bio-safety hoods – HEPA-filtered cabinets. Stewart said it can be difficult to hear with the air filter systems blowing, so every move by researchers is calculated and announced. Colleagues take their time in handing off equipment to one another, so as to avoid torn gloves. It’s “almost like you were working underwater as two divers,” Stewart said about working in the BSL-3 lab with a colleague. Anthrax isn’t always lethal, so the scene is quite different inside a BSL-2 lab at Bond LSC where Stewart studies non-virulent strains. BSL-2 labs study infectious agents that can cause disease in humans, but are usually treatable. Researchers only need lab coats, gloves and eye protection in these labs and all waste must be autoclaved. Here anthrax and other colonies of organisms are stacked in covered Petri dishes and handled without any Tyvek or air pumps. The Anthrax bacterium researched here is missing a specific plasmid, a DNA molecule essential for virulence that protects the anthrax bacteria from white blood cells that attack them. On top of that, all samples in this lab are wet, and anthrax spores are only dangerous as aerosols when dry. Before 2001, Stewart said virulent strains of anthrax were only labeled BSL-2 agents for this reason. There are now only a handful of anthrax-dedicated labs in the U.S., Stewart said, trying to name them off as he counted his fingers. The Bond LSC has not had any lab higher than a BSL-2 plus for years now, not since the BSL-3 research moved to LIDR, Stewart said. Several local residents called when LIDR was under construction and asked questions and voiced concerns about the facility and the work to be done there, Stewart recalled. However, Stewart said he and his colleagues gave the callers honest answers, and he has not heard of any pushback since. 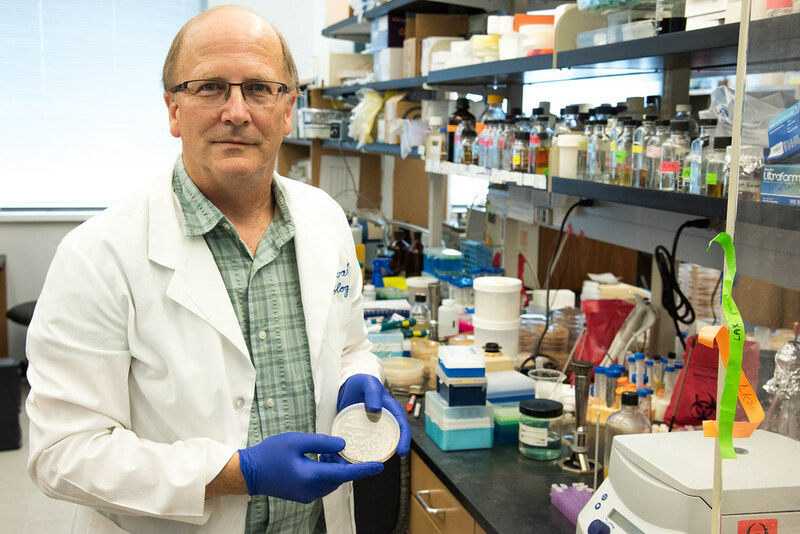 Stewart sees bio-containment labs as positive technological achievements in the study of disease – without them, many advances in treatment would never have been possible. In terms of the work done at facilities at MU and in the Bond LSC, Stewart said “we have the facilities, we have the equipment, we have the training,” to ensure the safety of researchers inside the labs, and even more so everyone else on the outside. Anthrax is not contagious and responds well to antibiotics, despite concerns in the scientific community Stewart shared that there is a possibility antibiotic resistance could be intentionally engineered into anthrax. Stewart could only think of a couple of cases when lab workers got infected with the organism through mishaps, and those were at USAMRIID – the United States Army Medical Research Institute for Infectious Disease at Fort Detrick, Maryland – when anthrax was produced there in very large quantities for research of it as a bio-weapon during the Cold War. He does not want to make light of the dangerous organisms he works with, but inside the BSL-3 facility at LIDR, Stewart said that breathing in HEPA-filtered air all day there does do wonders for his hay fever. Stewart couldn’t help but share a chuckle with that one. Laughter might be the most un-containable thing in nature. While walking through the A.L. Gustin Golf Course in Columbia you might be surprised by blossoms of milkweed or wild bergamot. While some golfers consider it a pests, golf course superintendent Isaac Breuer said properly managed wildflowers in the golf course turned into an important sanctuary for pollinators, such as bees, birds and butterflies. About 90 percent of all plant species need the help of pollinating animals. It has been estimated that pollinators deliver one out of every three mouthfuls of food people eat. The population of pollinators is dwindling, so the human-made habitats of native wildflowers can help to maintain the number of pollinators. The practice of planting native plants at the A.L. Gustin Golf Course was one example of local initiatives to maintain native pollinator populations. 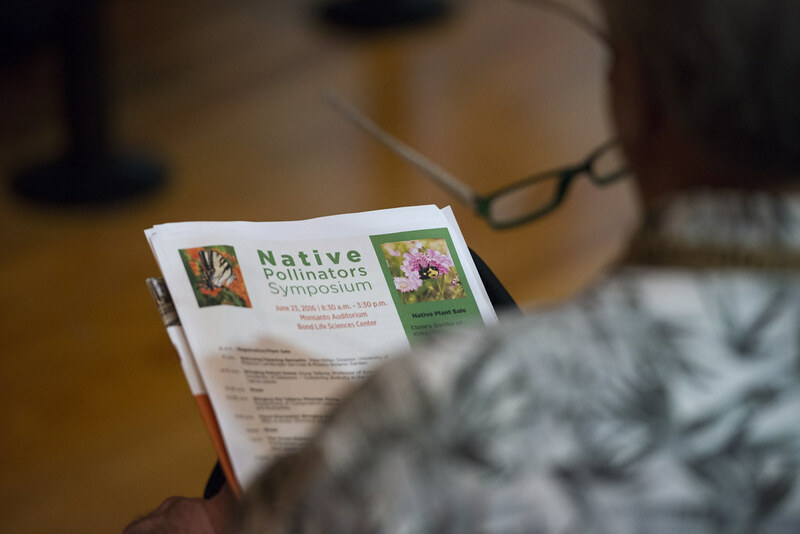 Mizzou Botanic Garden organized the Native Pollinators Symposium as a part of National Pollinators’ Week, which ran June 20-26. 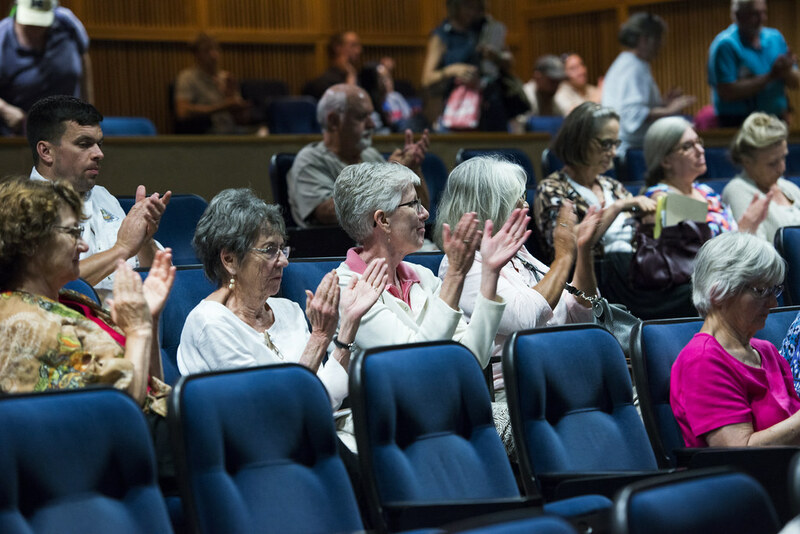 People gathered in Monsanto Auditorium at the University of Missouri’s Bond Life Sciences Center to learn more about the importance of pollinators. 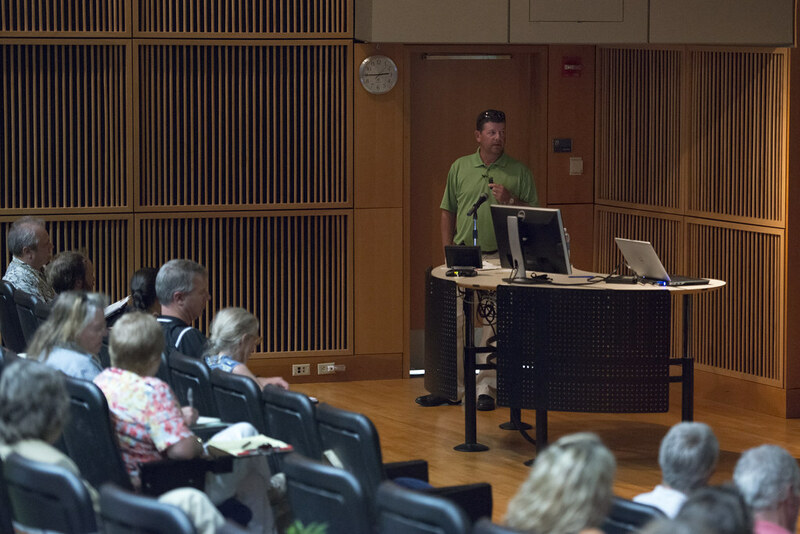 Breuer shared his experience enriching the environment and turning the 18-hole golf course into pollinator-friendly. His staff worked together with Missouri Department of Conservation to establish natural habitats in specific areas of the golf course. Now, the mix of native grasses and wildflowers cover more than seven acres of the course. Breuer said they do not affect the pace of the game because native plants are located in the areas where golfers usually do not play. Golfers can see asters, blazing star, coreopsis, wild bergamot, purple coneflower, rattlesnake master and black eyed Susan blooming in spring and summer. The habitat needs 2-3 years to mature. That time commitment pays off. By then, it not only looks good and draws wildlife, but also serves as education tool on the importance of natural habitat and native pollinators. “This golf course is my office, so I try to do things out there that can make the golfers and the environment happy,” Breuer said. Microscopes have come a long way since Anton van Leeuwenhoek first looked at single-cell organisms in the 1600s. Now, cutting-edge microscopes allow scientists a better look at how cells interact and work. The results were easy to see Tuesday morning when a new digital light sheet illuminated all the cells in a zebrafish embryo of Anand Chandrasekhar, a Bond Life Sciences Center scientist and professor of biological sciences. The fish, with its two eyes, brain and spinal cord lit up like a green-colored digital ghost floating in invisible black waters of the monitor screen. This new microscope joins an array in the Molecular Cytology Core, or MCC, located at Bond LSC. The MCC is one of nine core facilities at MU that provide vital services across campus, from DNA sequencing to imaging. 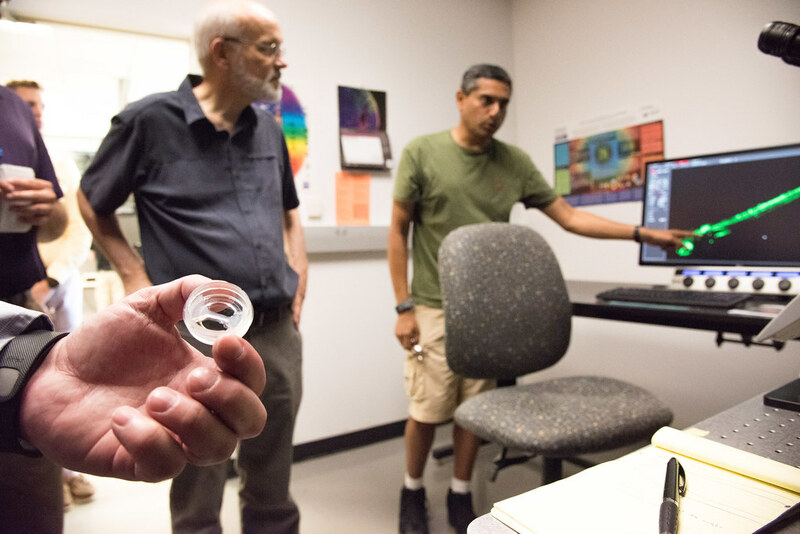 Researchers and staff at the MCC showed on Tuesday how the new capabilities of the technology give them and MU a competitive edge in their research through better visualizations of their experiments. The digital reconstruction produced by the light sheet combines “a whole bunch of images over an extended period of time,” Chandrasekhar said. Thousands of images of a cell or organism can be generated by the new equipment, at speeds of hundreds of frames per second, creating a picture that can easily take up a terabyte of hard drive space. At those speeds, Chandrasekhar said he can “literally watch neurons in the brain light up” in real time. He observes how neuron changes occur in the fish’s brain as the animal goes about its different routine behaviors like avoiding possible predators and searching for food. With this capability, researchers like him can study how neuronal networks develop. The new digital light sheet uses less damaging light than traditional microscopes and allows for clearer pictures, often with a 3-D look at their structure. More advanced imaging equipment also allow for faster, larger volume experiments that are gentler on the biological samples used in them. Thomas Phillips, MCC Director and professor of biological sciences, explained how his center now can better serve scientists across campus. 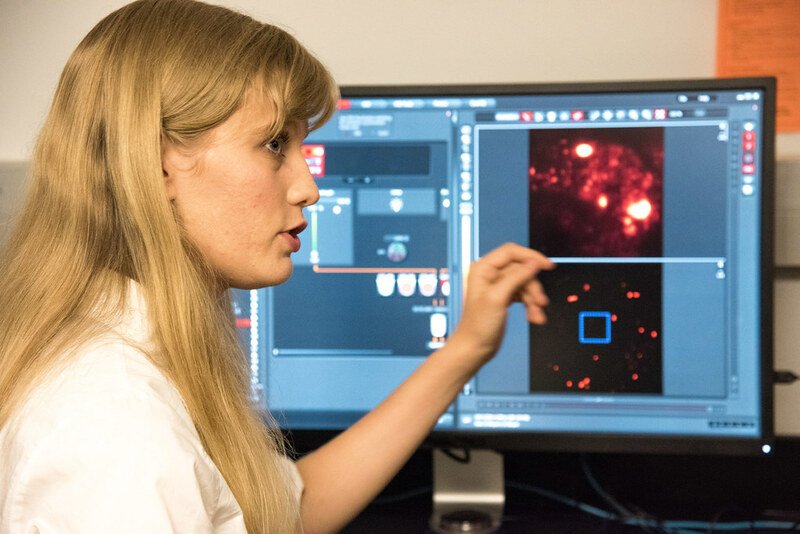 In addition to the digital light sheet imaging system, the MCC also has two new super-resolution microscopy systems, what Phillips said researchers across campus expressed they needed most. The presence of these super-resolution systems in particular puts MU at the forefront of microscopic research. Traditional confocal microscopy systems, while still useful, have limitations in their resolution which super-resolution systems overcome by how the specimens are illuminated. In addition to having technology other institutions do not, MU has a higher quality version of super-resolution. Phillips explained that while systems at other institutions use two different lasers in the internal mechanisms of their imaging equipment, MU is one of less than 10 or 12 schools that has access to a super-resolution system that has a unique three laser combination that increases the resolution of the system. “Super-resolution microscopy allows us to see how individual proteins are interacting inside cells in ways we haven’t been able to before,” he said. 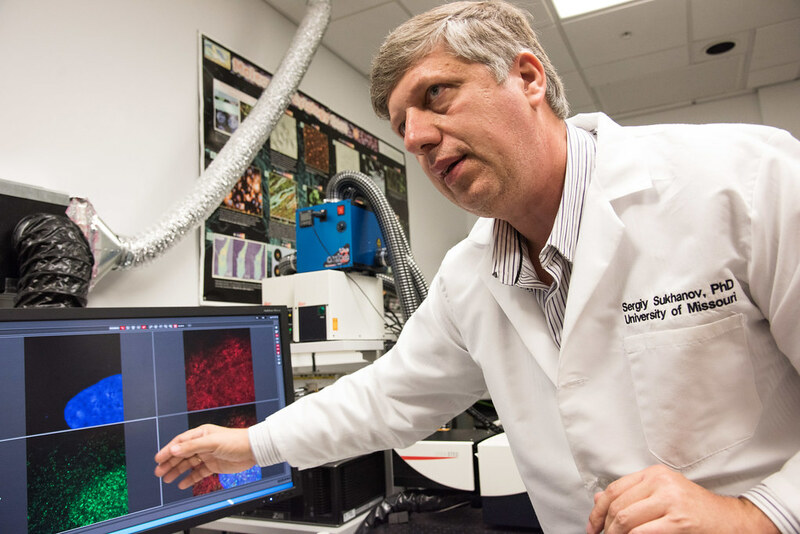 Sergiy Sukhanov uses one of the super-resolution microscopes in cardiology research that looks at failure of organ systems. Sukhanov studies heart failure and atherosclerosis — the chronic, dangerous build-up of plaque in arteries that can create blockages that lead to heart attacks, strokes and death. The associate research professor at MU’s School of Medicine showed on Tuesday images of protein interactions in the smooth muscle cells that line arteries. The goal of understanding these interactions is to help keep these smooth muscles in the healthy condition they need to be in to prevent catastrophic blockages. With its capability of a resolution of up to 30 nanometers, Sukhanov said that the new equipment’s advantage for him is that he can actually see the cell he’s working on. Soon, he hopes to be able to work with live cells so he can observe changes in their protein structures in response to changes in their environment in real time. Availability of the new equipment lured Sukhanov and his research team to MU over other institutions in 2014. He explained that he struggled to find the equipment he needed for his experiments at Tulane University in New Orleans or elsewhere in Louisiana. Other systems at other institutions usually only have a resolution of up to 50 nanometers. MCC not only provides services across campus, but can give scientists insight into how to better look at their specimens. First-year graduate student Jennifer Wolf displayed a super-resolution image of cancerous liver cells infected with Hepatitis C that been treated with a drug thought to prevent the virus from spreading. The drug aggregates viral capsid molecules – the outer part of a virus – within the infected cells to effectively contain them. Wolf said with the new equipment she is now able to see an individual molecule, and using that see the overlap of proteins, RNA and DNA fragments, which can help determine the effectiveness of drugs in treatment. Associate director of the MCC Alexander Jurkevich explained that the super-resolution equipment also allows for the compilation of separate images into an even more detailed 3-D projection. Wolf pulled up an image of green-colored mitochondria surrounded by red micro-tubules, green hubs of cellular activity connected by red highways that looked almost like a city from space at night. Wolf used the 3-D capability and rotated the image. She turned the biological intricacy on its side until it looked something like a galaxy on a cosmic horizon, only this view that maybe even fewer people have witnessed is microscopic. “It’s important to use new technology like this to help the University of Missouri to stay on top,” Wolf said.